It is five years since a stationer in Rawalpindi came up with the bright idea of printing flags for political demonstrations. Not Pakistani flags to be waved in celebration, but Danish flags to be burned in anger at blasphemous cartoons. Since then, Syed Mohammed Hussain has seen his one-off experiment turn into a profitable little sideline as he produces American and Israeli flags to order. This week brought fresh demand for the Stars and Stripes with a wave of demonstrations against American allegations that Pakistan was using an Afghan insurgent group to wage a proxy war against US forces. But it all started with protests at caricatures of the Prophet Mohammed printed in a Danish newspaper in 2006. Pakistan witnessed some of the fiercest demonstrations, with two people shot dead. “I was also very angry about the Danish cartoons but I wouldn’t have gone out on the streets myself. Instead I decided to get Danish flags printed,” said Mr Hussain, who sells his flags for 500 rupees or about Â£3.50. Word spread fast and he couldn’t keep up with the orders. Today, bulk buyers â€“ looking for more than 100 flags â€“ are given a discount. And there has been no shortage of business this year as relations with the US have fluctuated between poor and catastrophic. 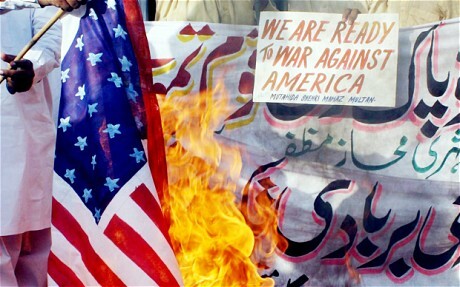 The killing of Osama bin Laden in May ignited a spate of flag-burning protests. Many Pakistanis were angry that the US could launch a secret, unauthorised raid on Pakistani territory. Today his storeroom has a selection of western flags, including the Union Flag and French Tricolour, ready to be stamped, trampled or burned. Mr Hussain said he wasn’t sorry his hard work ended up as nothing but a small pile of ash. “The demand is there and if I don’t sell them, someone else will,” he said.